Sky’s The Limit Where Do You Even Start? No Ifs And Buts How Few? Posted in Misc and tagged irish times, property supplement, Rory Hearne at 9:56 am on May 21, 2015 by Broadsheet. Generational debt is a small price to pay for keeping Conor Pope well paid. Nothing can justify paying Conor Pope a wage. It’s called advertising and it equals revenue which is sorely needed by print press these days, to protect jobs as much as profit – a dirty word for Hearne and Mercille. And long term, journalists and their employers like everyone else, have nothing to fear from another bubble and crash. Same argument for banks – they need to save jobs and make profit – 100% mortgages all round. I really hope short-termists like you are in the minority this time around. Its fascinating to see what the london evening standard having been doing with the frontpage. 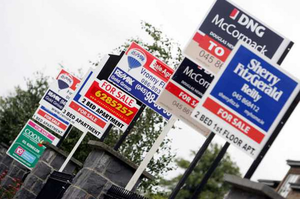 The property ‘boom’, which is restricted to Dublin, is a case of demand and supply. There are more people wanting to live in Dublin then there are quality residential properties available, driving up the price. The thirty pages of property are a symptom of this, not a cause. The same is happening to an even greater extent in the rental market in Dublin, but there’s no rental property section, so you can’t post pictures of it to justify your lazy intellectual fallacy. Compare the Times property section with any other similar section in other newspapers. They report on trends in the market, notable houses for sale and from time to time advice for renters and buyers, and yes, they sell advertising. 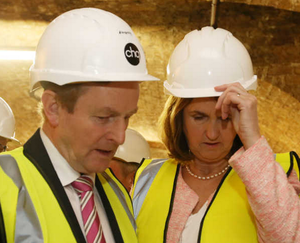 Ire at the state of the property market would be better placed at the door of our policy makers and the central bank. If it was a case of oversupply, there would probably be 40 pages, imagine! Isn’t that the point of the piece, all papers, all doing the ‘promo’ bit for the market. Advertisers looking for an environment that doesnt talk of caution, or spiralling prices… it’s just a big BUY NOW ad, a 30 page ad promoting the market without any critique of it, is careless and far from objective. Why would ANYONE selling their house advertise in a paper telling people not to buy? Why isn’t Rory tweeting about MyHome.ie, daft or DNG? They are all in the business of maximising property prices. The property “boom” was fuelled by cheap credit and lax oversight, not property advertising ffs. It would actually be in MyHome and Daft’s interests for supply to increase, the prices wouldn’t effect their bottom line as much. DNG though, obviously a more competitive market driving prices is in their interest. Em… are you having a McFly moment? It’s a ‘Property Supplement’…. it’s where they do place their editorial critique about the property market…. that is, when they do write one. If they want to be just a conduit for ads, fine, but the paper cannot say it is objective on the topic if it goes down this route as it did before. So right beside articles cautioning against selling houses, you would have advertisements for selling houses? Sounds like a broadsheet post to me! The main section of the paper would be more the place for an analysis of the property market, and even then it would be an objective analysis of the reports published by estate agents and websites. I don’t know what you expect. It’s the residential property supplement of the Irish Times. Hardly surprising it contains property-related articles. What did Julian really expect to find in there? Also worth noting that the pages of the property supplement are filled with photos rather than text so it’s not unreasonable that the supplement will be longer than most other text-based newspaper supplements. I’m confused as to whether Rory is aware that this supplement to the Irish Times has existed weekly for a very long time now? It existed when property in Ireland stagnated for a long time, when the bubble was growing, when it burst, when property in Ireland hit rock bottom and where it is now. It’s existed as long as there’s been property for sale, whatever return the sellers are getting on them. Why wait until the 21st of May 2015 to be outraged? It genuinely frustrates me when people vent about something without the tiniest bit of research to help their opinion. On the other hand, if Rory was aware of its existence all this time then I’m not sure how his argument works. So what do you expect Rory? Should estate agents all shut down too? Should they not accept offers over the asking price? It’s just not a very well constructed tweet, bit like some of the houses being advertised. While the IT (and other newspapers) need to make money to offset declining readership figures it seems as a country we’ve learnt nothing from the past few years when it comes to property and the hysteria it engenders in everyone. Think that’s what he tried to say. You’re being kind. You can often pick individual parts of a larger broad statement and find them to be true. It’s also an easy out for the original speaker as they agree that’s what they meant after their original broader point was critiqued quite harshly. Whether it’s in fun or not, people need to articulate their annoyances better or hold them off until they have. The more I think about the more maddening that moronic tweet is – the Chomskian manufactured consent/false consciousness that it implies is one of the economic left’s worst traits and one that helped do for Ed Miliband. In other words the plebs are so dim that 30 pages of advertising in a newspaper will make the lemming like readers immediately ring a mortgage provider and put themsleves in disastrous hock to buy a tiny pad in some leafy suburb. Not only is it patronising guff – as per Mercille’s Monday missives on Broadsheet – it’s plain wrong, economically, culturally and politically. it’s one of the reasons why the left is on the retreat everywhere. I think it’s a bit more subtle than that. Firstly, what you say is more or less correct – folks aren’t going to pick up the property supplement, and then rise, as if in a trance, and shell out for a tiny gaff with a huge pile of borrowed cash. The “problem” with the Times having a huge property supplement isn’t – therefore – the issue of advertising; advertising is probably the second oldest profession in the world. Practitioners of the oldest profession had to get the word out, after all. The point is that if property advertising revenues contribute *so much* (and I’m not saying they do) to the bottom line of a newspaper, then there’s a possibilty that analysis of the property market and what it’s ‘doing’ to society/the economy might be tempered. In other words, folks who want to shout ‘steady on’ if/when things start getting crazy might find their stuff ain’t getting printed because the lads over in advertising are pointing to the piles of cash rolling in. Tsk tsk… property section with glossy pictures of houses?.. they’re practically FORCING you to buy!! As a paid up member of Generation Negative Equity I just hope the boom gets boomier baby. There has always been property supplements for those interested in buying or selling property. Similarly there are jobs supplements…and motoring…oh, and holidays too. Such is the fabric of life. Wakey wakey kiddo. Its pure comedy too, one carbuncle in D6 which is on for 2.9 mill and is lauded. The writer points out that the owners designed it themselves before calling in an architect but fails to mention that they were obviously blind and lacking in any taste or style because the built a 5000 sq ft pile of shite. Some even vaguely critical points in the puff pieces might show some learning from the times, but alas it is no longer the paper it once was, mainly just a large format way of reprinting press statements and the hate filled bile of Breda o Brien. Its the traditional end of spring selling season issue. Anyone who wants can monitor the reduced no of pages in the property section in the quiet summer months. The next traditional selling season will start in September- Nov / early Dec.
Sean Dunne’s house made the cover of the Property section, and The AIB Site was the cover of the Commerical property section yesterday (Wednesday 20 april) was also a Sean Dunne property. Both have been brought to the domestic & international markets to be sold by the receivers to pay back the Irish taxpayers. Last week the Ballsbridge Hotels site was put up for sale by the receivers, previously owned by Sean Dunne and financed by International Banks. Is all this not driven by the banks to claw back reckless losses from the previous bubble? – throw petrol on the fire, let prices shoot up, when we hit the values required to disolve our losses – dump dump dump, watch the arse fall out of it again, but we’re ok though.